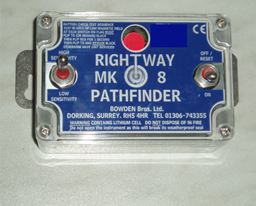 As a derivative of the standard MK8, the MK8 SWER is designed to find faults on a SWER (Single wire Earth Return) network, where the fault current can be very low. The SWER version has a variable sensitivity which can be selected according to the perceived fault level at the location of the instrument. On very long rural overhead SWER networks, often tracking faults is very difficult. The MK8 SWER makes this task very much easier.